Over the last week or so, we've been watching the cherry tree in our backyard. It seems the time is finally here to pick them. It's a balance of waiting to just the right moment and saving the cherries from the birds. 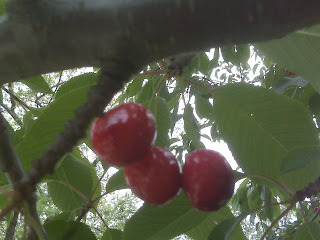 So Elly, Ken, George and I headed out at about 11:30 yesterday morning to start picking what seemed to be the ripest cherries. 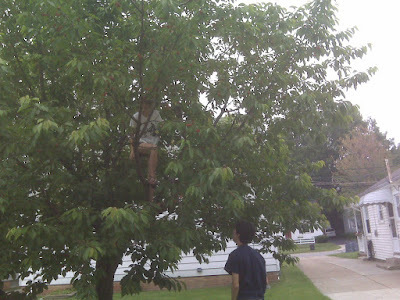 An hour later we had barely made a dent in the cherries on our tree. Still I think we gathered something like 500 cherries. 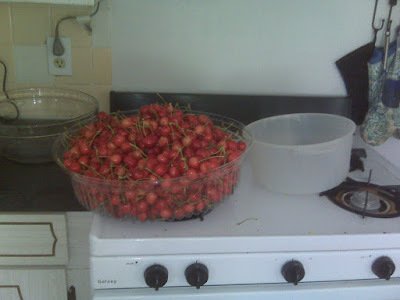 The picture below are the cherries we gathered sitting on our stove. 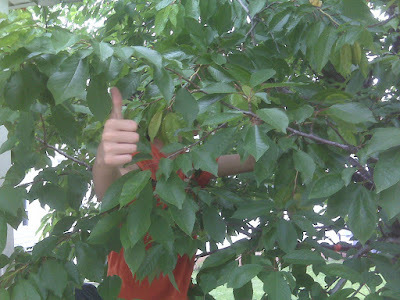 From this picture, you really can't get a sense of how many cherries there are, but trust me there is alot. This is way more cherries than we can eat before they spoil. Plus, the tree is still full of 'em. We'll bring most of those we gathered to the JANO Picnic today for people to snack on. The rest we'll probably make some preserves, or jam. We might try a cherry pie.